Green Exchange is the country's first commercial real estate development designed for the advancement of green business. By bringing together an opportune mix of exceptional organizations under one roof, you'll find a dynamic environment that fosters synergies and provides constant opportunities to grow green exponentially. Business is increasingly going green. In the U.S., Europe and around the globe, organizations are realizing what it is to be both successful and sustainable. Green Exchange moves the green marketplace from niche to mainstream. Its mission is to further the new green economy, serving people, planet and profit. 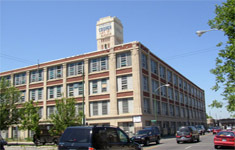 The four-story 250,000 SF, Green Exchange, located at 2545 West Diversey Avenue, will be converted in accordance with Leadership in Energy and Environmental Design (LEED), with an aspiration to Platinum certification. It will provide a significant retail presence, showroom galleries, office space, incubator lofts and attractive common areas, creating an epicenter for green businesses and organizations in the Midwest U.S.